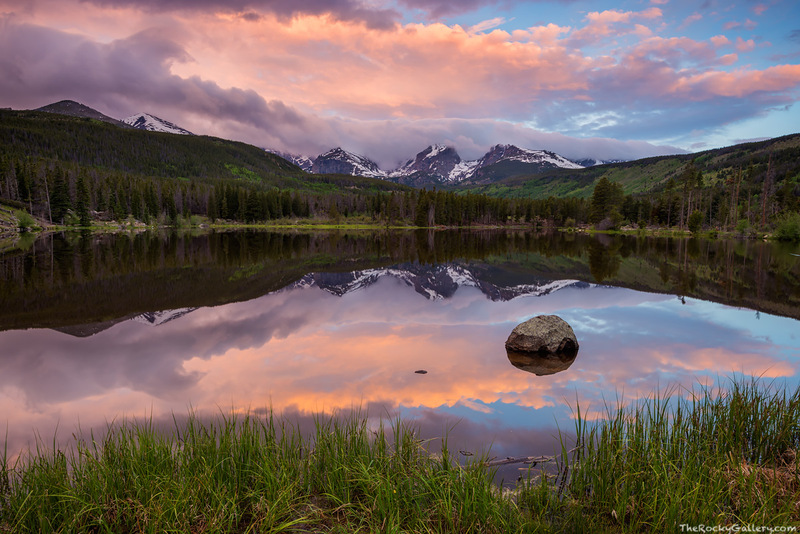 Pastel colors fill the sky over Sprague Lake on a June morning. The clouds have blocked the sunlight from lighting up Otis,Hallett and Flattop Mountains but the sky is filled with a an artists color palette which reflect perfectly in the still waters of Sprague Lake. Sprague Lake has one of the best views of the continental divide in all of Rocky Mountain National Park and when there is no wind and and beautiful colors in the sky above it's no wonder why Abner Sprague decided to build his lodge nearby. Photo © copyright by Thomas Mangan.